I have always loved sugared eggs with those pretty, little panorama scenes inside the beautifully decorated eggs. They were too lovely to eat and usually sat on a shelf for months after Easter had passed. I wanted to make my own version of these eggs without the temptation of eating them, so I designed a set of patterns to use with paper. 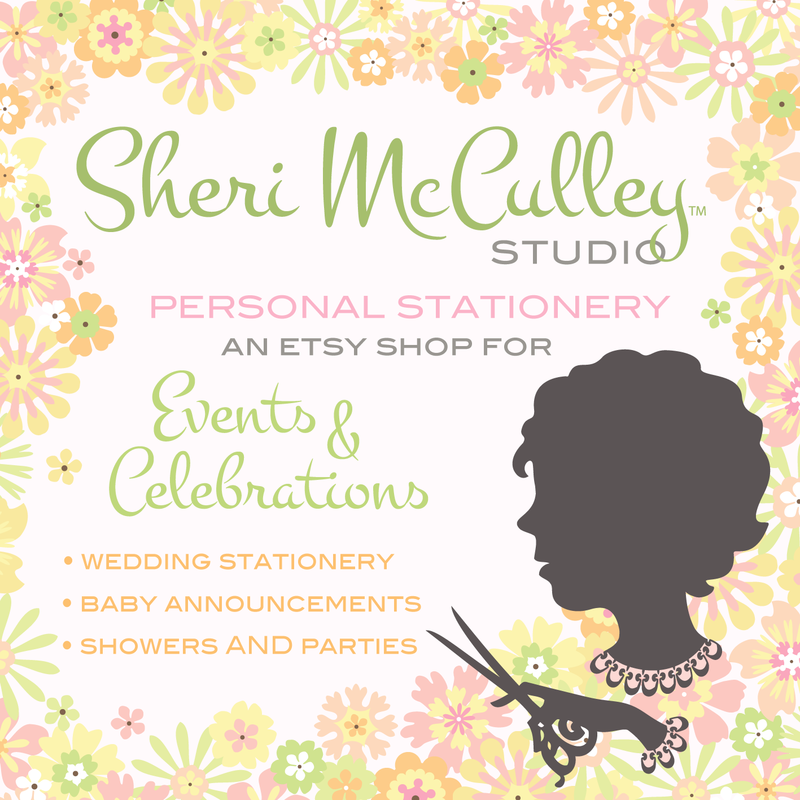 These templates are available on Lettering Delights within my Cut Flowers Easter collection, as Panorama Eggs. 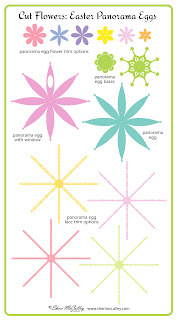 Here are the patterns you will get in this set (see image below) and the directions and helpful tips to make these sweet, but not sugared eggs. 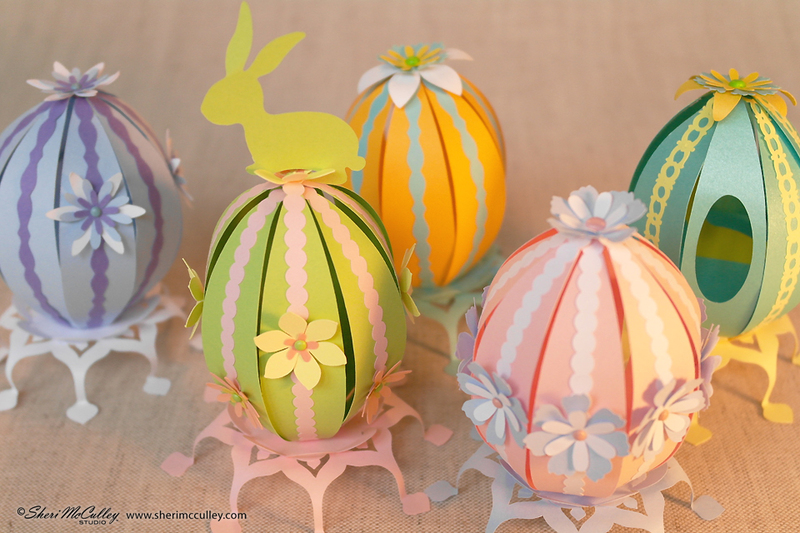 This set contains: two egg shapes (one with an oval for a window in the egg, and one to make a solid egg), four trim (lace) options, one two-part base, and six mini flower shapes for extra decorations. 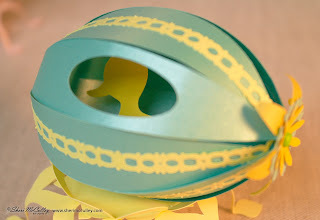 The photo below shows the egg with the window option for a panorama egg design (with little duck inside) an the two part base to sit the eggs on. To make the eggs (solid or window) follow these steps to get the best results, using thinner paper for this project as it will bend more easily. However, the two-part base can be made with thicker paper, but remember it must bend easily to make the stand. I chose 70 text weight paper for all pieces (most from Paper Source). The only other supplies I used were mini brads for attaching all parts and a bamboo skewer to bend the paper into shapes. 1. 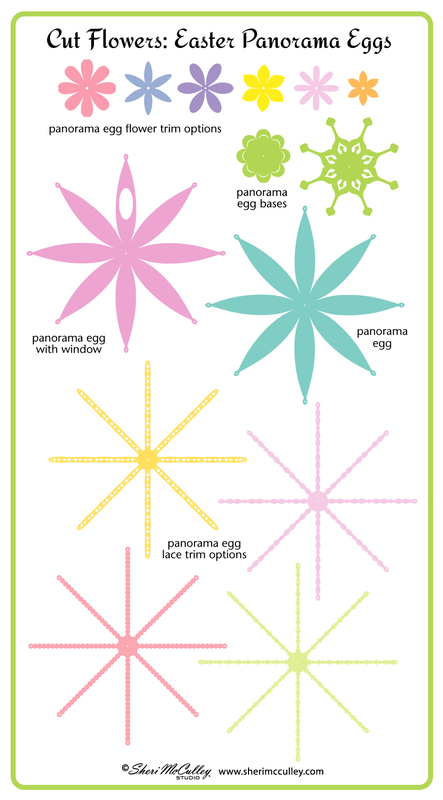 Cut out all pieces necessary for the panorama egg design: egg (looks like a large 8-pointed star-or with window), trim of choice (looks like a 4-crossed intersection), two-part base (looks like 8-pointed flower and 8 scalloped flower). 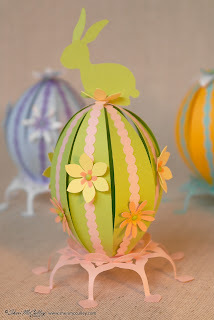 Then if you would like mini flowers on the egg at sides or top, cut out as many flowers as needed for the decorations. Also, if you would like small animals, use the Cut Flowers Easter Icons to cut the shapes (examples ~ duck and bunny). 2. Make the base first by bending the 8-pointed flower shaped piece with a bamboo skewer, thumb and forefinger so that the 8 points become the legs of the stand and then fold upward the last tip (or foot) of the stand to a 90º angle (as shown in the photo above) to make the piece free-standing. Then bend the 8-scallopped flower shape so that the ends of the scallops bend upward to make a little cup for the egg to sit in. You can then attach these two pieces of base/stand together with a mini brad through the tiny hole in the center of both pieces. Set the stand aside until later. 3. Next, make a slight bend with thumb and bamboo skewer to all eight sides of both the egg and the trim pieces. These will become slightly bowl-shaped pieces. You might want to make a hard crease (fold) where each of the eight sided of the egg and trim attach to their center so that the egg is more flat when sitting on the base. 4. 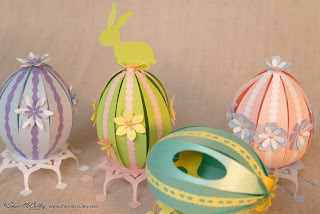 If you are going to add mini flowers to the sides of the egg, I recommend flowers that are either every other piece (side) of the egg, or staggered flowers on each piece (side) as shown in the photo directly above. You can make each of these sets of flowers and attach them together with mini brads and set all aside until you are ready to attach them to the egg and trim shape. 5. Once you have all decorative trims made up (including the top flower, but do not brad it together yet) you can begin assembling the egg. 6. 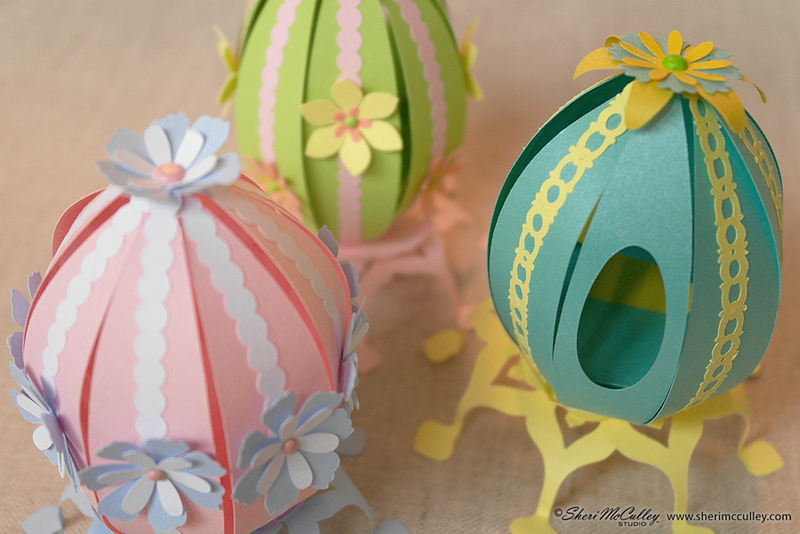 Before attaching the egg to the base, attach each flower where you want it on each piece of the outer curve of each egg and trim side (lining them up with the trim centered inside the egg piece/side) then use the mini brad (that is holding the tiny flower together) to attach the flower in place to each piece/side of the egg. 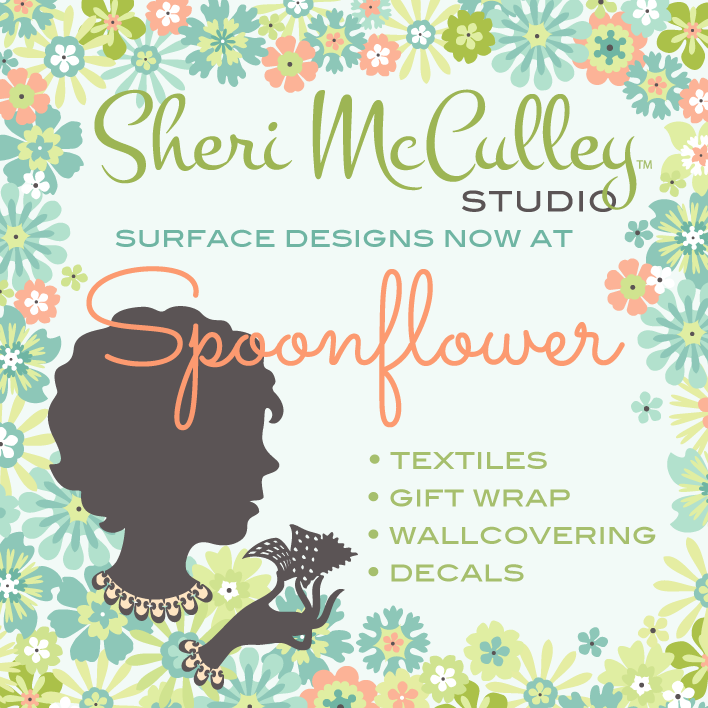 Do this by piercing each side where you want it, then use the brad to hold the flowers into place. Once this is done you should have what looks like a large, slightly bent 8-pointed star with trim along its centers (vertically) and little flowers attached to the pieces where desired with brads. 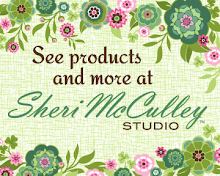 (you can see the flower positions/options and the trim options in the photo below). 7. This is the time you need to think of attaching the main parts in order from bottom to top, as it will be easiest to assemble this way. Start with the base that has been bradded together, undo it and reattach it together in this order: brad, bottom base, top base, trim, egg (with mini flowers), then separate brad and attach all pieces together so that the base is now holding the bottom of the egg (there is a tiny hole in the center of each of these pieces for the brad to fit through). 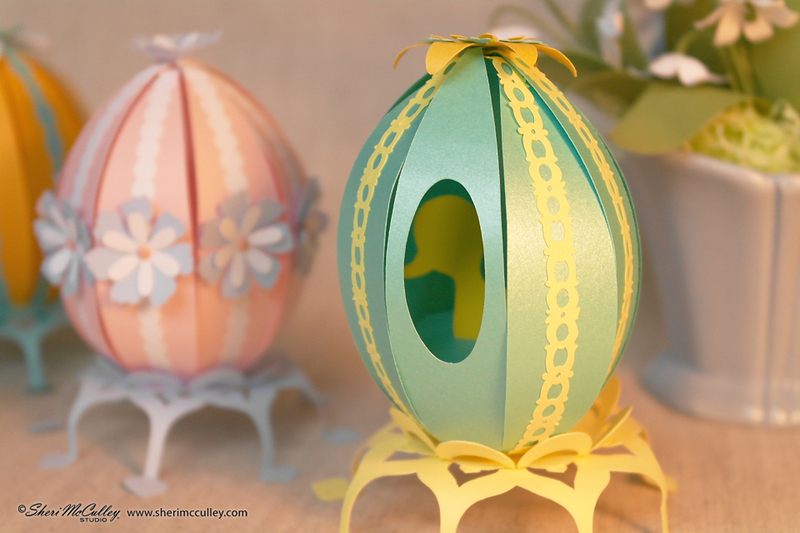 Remember to attach the egg/trim piece with the flowers and trim showing on the outside of the egg when bending up and inward. 8. Now you should start pulling the egg sides up to complete the egg shape and finish at the top with the flower. Take the final flower shape(s) you wish to have at the top of the egg and with the brad pointing down through its center, start pulling the egg sides up toward it and thread each of the eight piece to the brad using the tiny hole to place the brad through. (Here is a tip that might be easier to work with ~ you might prefer to use a dull needle rather than the brad to thread all of the pieces through from top of flower down through the egg and trim pieces ~ then once you have them all threaded through the needle, hold the parts in place while transferring out the needle for the brad that will then attach all parts together). You need to attach the egg sides in this order (think (N) north, (S) south, (E) east, (W) west, (NE) northeast, SW (southwest), NW (northwest), then SE (southeast) when assembling). First choose any side/piece and thread it, (I’ll call it the N side), then pull and attach the S side, next the E side, then W side (so you are attaching opposites), continue on with NE, SW, NW and finishing with SE. If you do it in this opposite-sides-order the egg will be more balanced and look more oblong shaped when finished. Holding all of the eight pieces on the brad with flower at top, now spread the brad to tighten and attach all parts together, squeezing the egg shape a bit to get the brad attached and held into place. Then gently move and position each piece to get the best balance of the egg. See the photo below that shows the top of the egg assembly. This completes the panorama egg (without the window). 10. 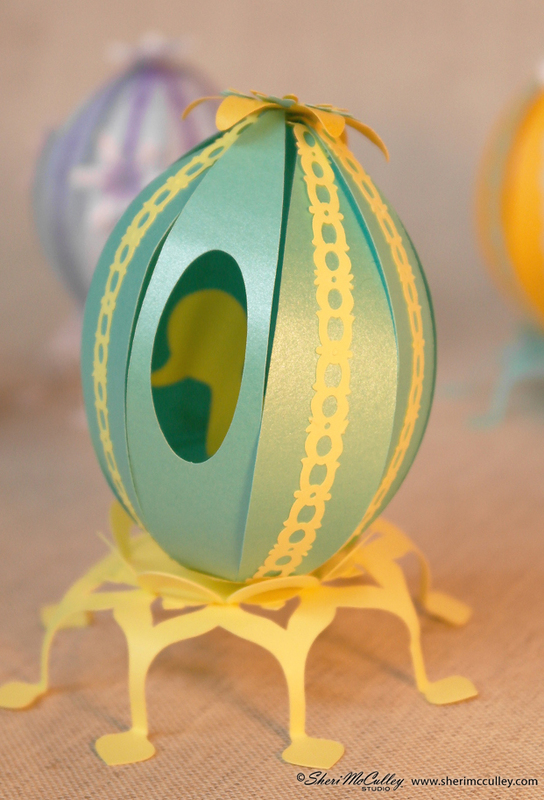 Now you can add the little animal cut outs shapes to the inside of the egg. 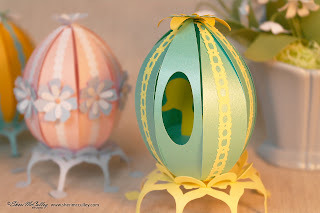 Since the egg has not been glued together, you can squeeze it a bit to get the animal shape (or flowers would also be cute inside the egg) into the middle of the egg. I chose to make a little table base to hold the duck into place, then made a small slit to hold the duck upright on the base inside the egg. Remember, you can have these eggs on their bases, as standing or sitting eggs (horizontal or vertical). Now you have a new way to make sweet panorama eggs, and if you would like them to look like sugared eggs you can add glitter to the eggs once they are assembled. They will be sweet, but last longer than the original sugared eggs and Easter. 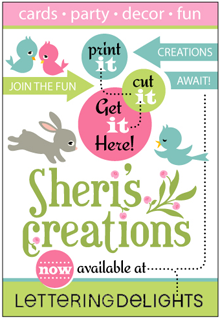 Great tutorial Sheri, thank you very much. You are so welcome. Hope it helps to get your panorama eggs done in time for Easter.